Federal fishery biologists expect only 30-million pink salmon, or humpies, will be harvested in Southeast Alaska 2016. That’s well short of 2015’s disappointing harvest of 34 million fish and 2013’s record catch of 95-million pinks. As part of a post mortem on last year’s wonky salmon runs, KTOO’s Matt Miller visited a weir near Juneau that has been recording salmon going out and coming back earlier and earlier for the last 35 years. Last year’s pink salmon runs in Southeast Alaska weren’t horrible, but they weren’t great either. It actually made a big difference where the fish returned in the Panhandle. Orsi speculated that warm sea surface temperatures may be responsible for this year’s high survival rates or larger fish size. But those results were not universal for all Southeast Alaska pink runs. Prince William Sound and Kodiak pink runs also came in strong. But why? For now, Orsi said they can only speculate on the reasons. Pink salmon returning to Southeast Alaska last year were the children of 2013’s big return that formed the basis for that season’s record 95-million fish harvest. Orsi earlier predicted that 54-million pinks would be harvested last season. Going off of his numbers, the Alaska Department of Fish and Game forecasted a range of 37- to 58-million fish that would be taken by all gear types. But only about 34 million were caught. It’s still unclear whether a persistent warm water anomaly nicknamed The Blob or a developing El Nino had any impact on those runs. Auke Creek is just one example of how some streams in northern Southeast had better returns than other streams further south. The Auke Creek Weir and Hatchery is a small, federally-operated facility tucked away in the woods in the 15-hundred feet between Auke Lake and Auke Bay. John Joyce, one of Orsi’s colleagues, is a research fisheries biologist at NOAA’s Ted Stevens Marine Research Institute who spends a lot of his time at the weir. He says local geography and the relatively low drainage area are big factors in the health of the system. “Flow is very important.” Joyce said. A low snowpack in the Auke Lake drainage melted early in March and April last year. That was followed by a very dry May and then heavy rain by July. Joyce used words like “phenomenal” and “incredible” to describe over 24-thousand big pinks that returned to Auke Creek this summer. That’s over a 51 percent marine survival rate for the 47-thousand juvenile salmon that passed out of Auke Creek and into the ocean previous year. 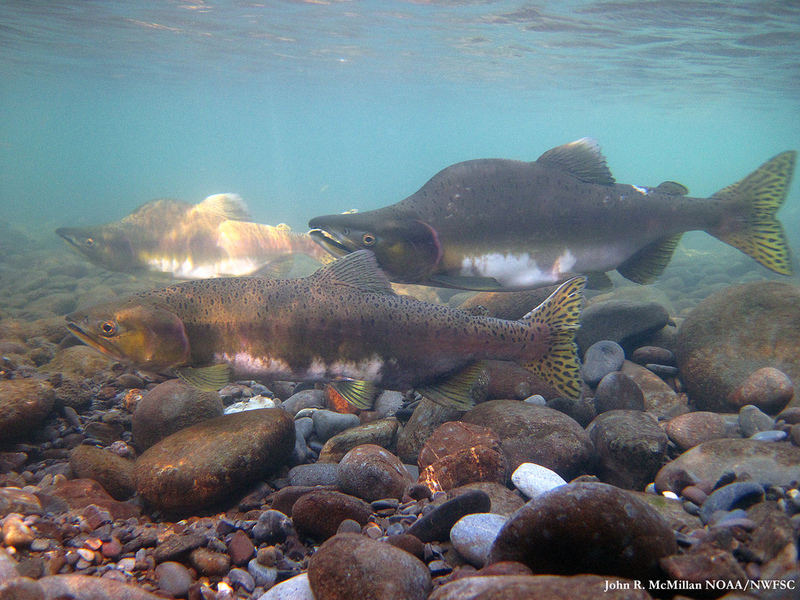 Normal survival rates for returning salmon range from a tenth of one percent to ten percent. The Auke Creek facility is unique because biologists have data on stream flow and water temperatures that correspond with 35 years of continuously counting salmon. Joyce said they noticed silver returns have been compressed into largely a two-week period while pink runs have trended two weeks earlier over the last three decades. “It’s substantial,” said Joyce. “And it has ecological implications, too, because these juveniles have adapted to certain timing to enter the ocean. Well, that adaption to timing could be differently influenced in fresh water than salt water. So, you could potentially have a mismatch where they’re going faster in fresh water but the ocean is not ready for them. Joyce said their research into migratory behavior and ocean survival has implications for resource management. Joyce says they’re collaborating with the University of Alaska of Southeast which is using their 35-year data sets in their research to determine how climate change is influencing migratory behavior, marine survival and productivity.